By the time we came along, Coraopolis had half a century of tradition in football and basketball, baseball played at every level from Little League to Industrial League, and bowling, golf and fishing as common recreation. 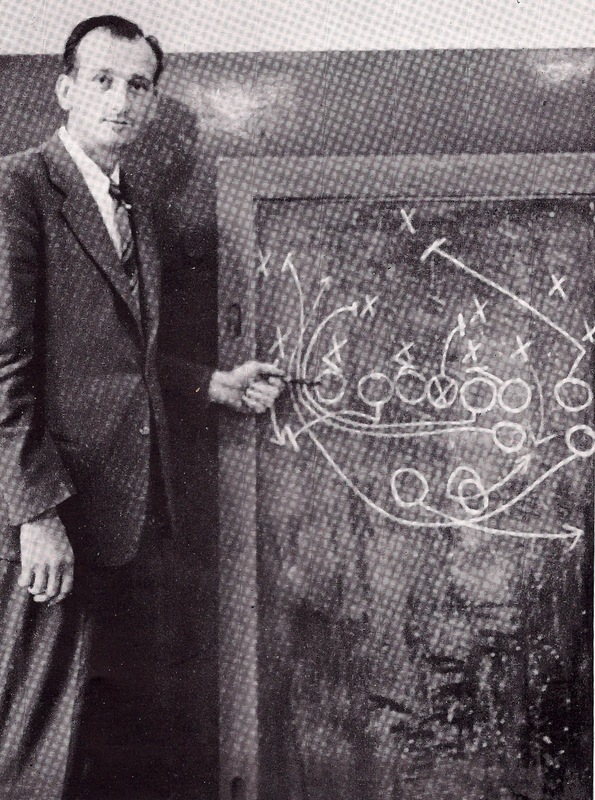 School teams under Herbert Snell and Fred Milanovich had long been perennial WPIAL contenders (twice Milanovich had undefeated football teams knocked out by a heartbreaking tie in the next to last game of the season, a curse which would loom large as we swung into the November portion of our own season). We had the finest football stadium in our conference. We had the most comprehensive age 12-15 sports program in the area. There were only 12 spots on the official junior high basketball team, but a Y/AAU team ran a parallel schedule for 12 more and 56 competed twice a week down at the YMCA in one of Allegheny County's most competitive intramural leagues. David's Cliques and Joe 's Dukes were good enough to draw crowds, especially when they played each other. We were the only school in the WPIAL to have coaches who had played both professional basketball and football. Even for those who did not play sports, the Friday night football games and Tuesday and Friday basketball games were an important part of our high school experience. Coraopolis took sports seriously. We took caravans and buses to away games and filled out stadium and gym. Our junior year as our JV team kept rolling undefeated, fans filled the gym by 6 pm. Our senior year, as the football and basketball teams picked up momentum en route to our championship seasons, the crowds became almost unmanageable. Tuesdays and Fridays were Major Events. Cory had no college or pro teams. The town focused all its attention on us. It was a magic time. But while the two big spectator sports grabbed all the head lines, there was lots of other action. 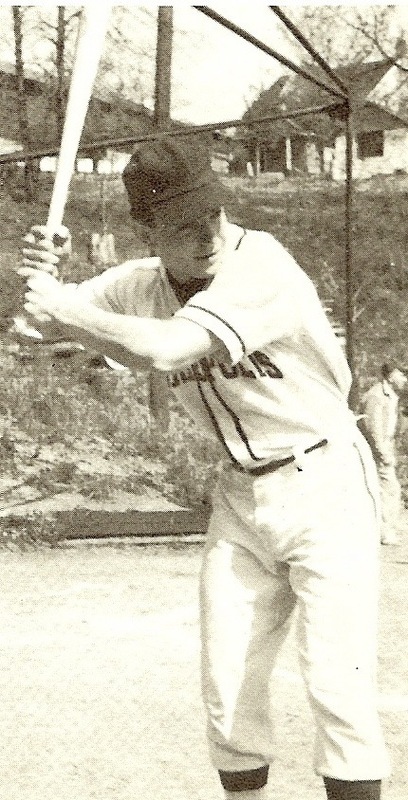 We all knew about Nick the All State halfback, but few paid attention in the Spring when he was just as spectacular on the baseball field, leading the team in hitting (right) and playing several positions. 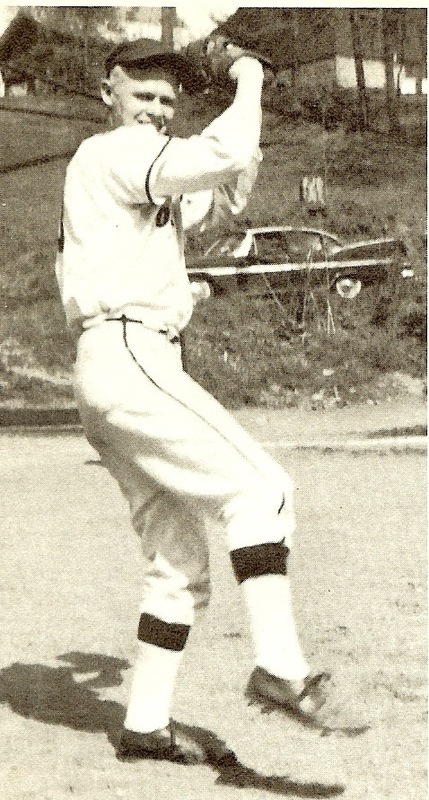 When Stowe merged with McKees Rocks and Coach Milan Tatala compiled a record book of all time stats, the grand slam home run Nick knocked out of the stadium in May 1960 made the list as the longest ball ever hit on that field. While we were in high school, Paul Brown's track team produced WPIAL and State records in the mile run and pole vault and state titlists in several other running events. During our three years, Coraopolis boys received full sports scholarships to Duke, Maryland, Penn State, Pitt, Miami (Fla.), Kentucky, Mississippi, West Virginia and Arizona State, not to mention many more who received full or partial scholarships to small colleges. So for a school of only 300 students in a town of only 10,000 population, we enjoyed a tremendous sports experience. Since we've been gone, the town has continued to produce basketball championships, but has never produced another football champion, and no longer even competes in many of the sports in which we were successful. 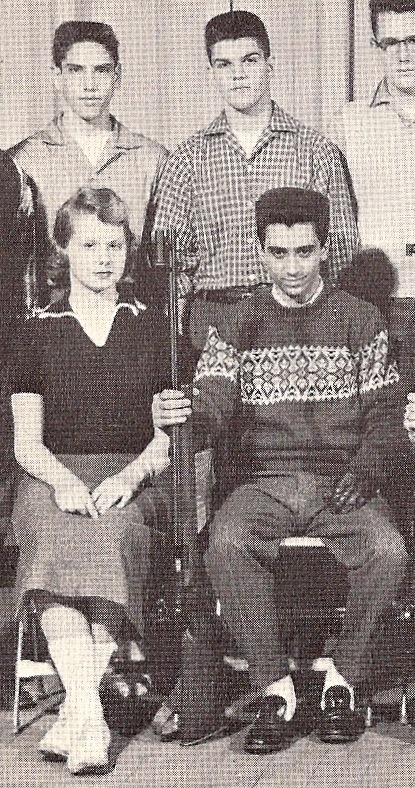 Probably our most unique and least visible program was our rifle team. For starters, it was unusual in that it was our only coed sport. Not only were girls welcome, but over the years many of the best riflers were girls. Second, since Coraopolis had the only rifle team in the area, our opponents were distant. In fact, Munhall may have been our biggest rival. Third, rifle matches were not announced to the public for a reason. They did not want spectators. Observors talked and moved around, causing distractions. This was a sport in which concentration was critical. For that reason no provision was made for visitors to sit or watch. They didn't even want newspaper reporters present. Flashbulbs popping and shutters clicking presented more distraction. So rifle matches were held in an eerie silence broken by the sound of chambers being loaded and shots firing. Coraopolis had always had strong rifle teams. During our three years, Louie, Nancy, Bob, George and Bill lettered. However, rifle in several ways was the most demanding sport we had. It did not require body mass, height, strength, quickness or stamina as did all other teams. Instead, it required tremendous concentration, ocular focus at significant distance, and, most importantly of all, a steady hand. One hand held the rifle barrel and the other squeezed the trigger. The one holding the barrel had to be able to hold its position for several minutes without trembling or wavering more than 1/128th of an inch. The finger squeezing the trigger had to be able to pull it straight back and impart no measurable pressure sideways or vertically. Rifle scores were measured in fractions of an inch and fractions of a point. The steady hands would be those that a surgeon. artist or dentist would need, so it was not surprising that Louie and Bob ended up in architecture and dentistry. 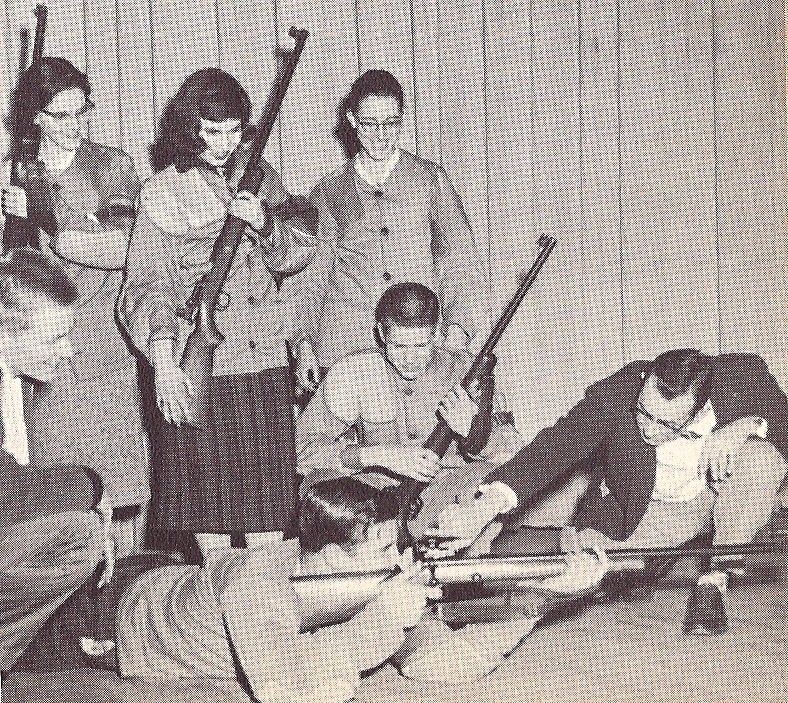 Paul Brown coached the rifle team during our time at Coraopolis. He compiled one of the WPIAL's best records and would eventually leave for a similar job in New Jersey. When Coraopolis was merged, the rifle team was dropped. One of the best kept secrets of our time was the athletic talent of our girls. Had Title IX been passed in time for us, we would have won sectional championships in volleyball and basketball to add to the boys' football and basketball honors. The girls were not as tall, could not jump as high, and lacked upper body strength. But the best of them were quicker, had better hands, were precise passers and dribblers, and could shoot as well or better as the boys. They played a finesse game rather than a strength and power game, but they were very good at it. The girls who showed up at playgrounds and driveways frequently won at Horse, Mississippi and 21 and could hold their own in halfcourt games out at guard. Janet was probably the best 15 foot jump shot in the high school, male or female, and Janice may have been the best all round athlete in town, male or female. 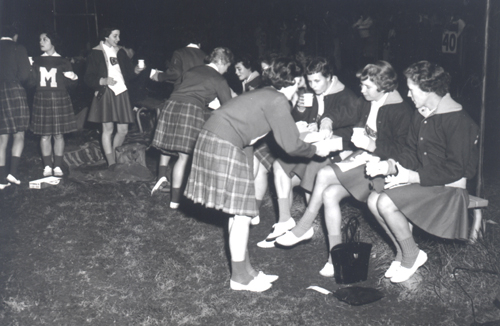 Unfortunately, state regulations in the fifties did not allow open competition for girls. So they had to be content with nonpublic games against other schools. Scores could not be put in newspapers. If they had, the town would have learned that our girls were major contenders in volleyball, basketball and gymnastics. Many went on to star on intramural teams in college and a few ended up coaching high school teams. The only window most of us had into this secret world was during lunchtime intramural games. 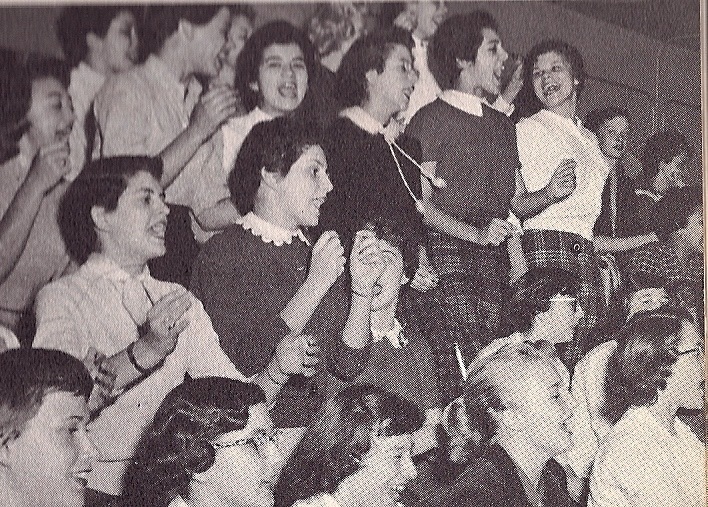 Students would usually be filtering back into the building while the games were in the fourth quarter, and the bleachers would often fill with spectators. 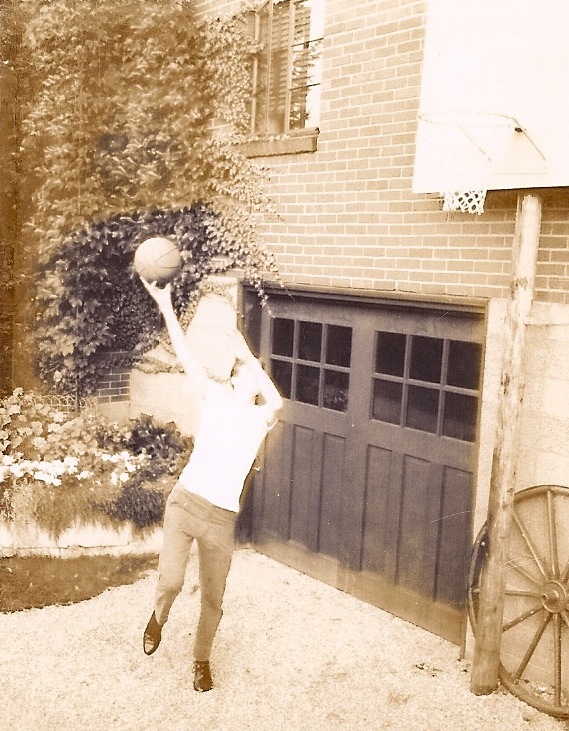 Notice the perfect shooting form in the photo here at left as the shoulders and feet were squared up, the ball rolls off the fingertips and the right arm is exactly lined up with the basket. Coach Ruth Brunton had huge advantages in volleyball. The gym was empty. She didn't have to schedule around the boys. And, unlike basketball, our gym could be made into a full sized volleyball court so we faced no handicap when visiting other teams' courts. With no other girls sports during the Fall, she got her pick of the school's best talent. As a result, Coraopolis had a long tradition of fielding strong volleyball teams and our senior year was no exception. Not only did Coach Brunton have these 11 experienced seniors but 20 juniors and sophomores gave her depth, including three top juniors who were almost as good as her seniors. Today, girls high school volley-ball is HUGE, drawing big crowds and sending girls off to college on full scholarships. Had this been true then, several of our girls would have won those scholarships. Teams in Cory's section were Quaker Valley, Avalon, Avonworth, Bellevue, Mt. Lebanon, Carnegie and Apollo. Cory finished the section with a 13-1 record. They lost only at Quaker Valley. Since no one else beat either team, they finished tied for the championship, requiring a playoff which Cory won. Most of their wins were onesided, the worst being 45-6 over Apollo. Our girls were not especially tall, but Janice and Marianne could leap and had the timing for repeated spikes. Jean was the best setup artist in the league. And all that experience helped. The girls committed very few errors; in several games they committed none. With 11 seniors, Coach Ruth Brunton figured to have a strong girls basketball team. In hind sight, four of these 11 would play competitively in college and three others (Elaine, Grace and Marianne) could have. That meant seven college prospects in a school of 315 students. 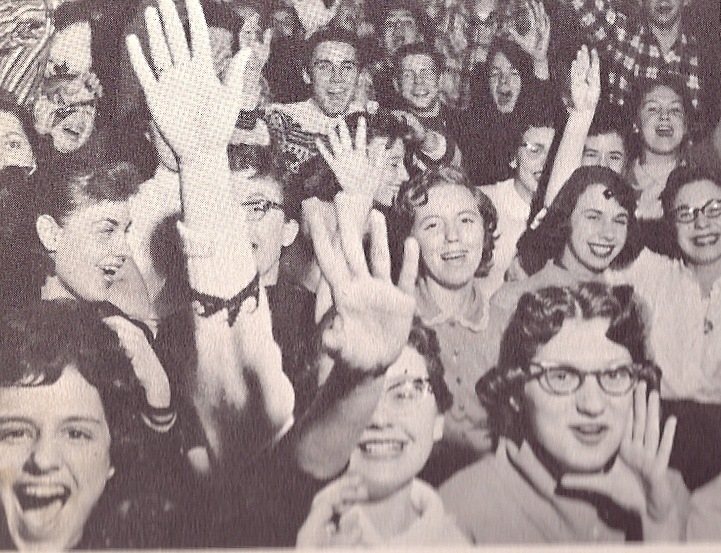 Had Title 9 been in effect, the boys would have been pressed to draw the headlines and crowds these girls attracted. As it turned out, with no crowds and no coverage, they easily beat everyone in the area including predicted top team Bellevue. Said Coach Brunton, "They never beat themselves. They were the fundamentally soundest, the quickest, the best shooters and best defenders I ever coached. In my career I never again matched them." 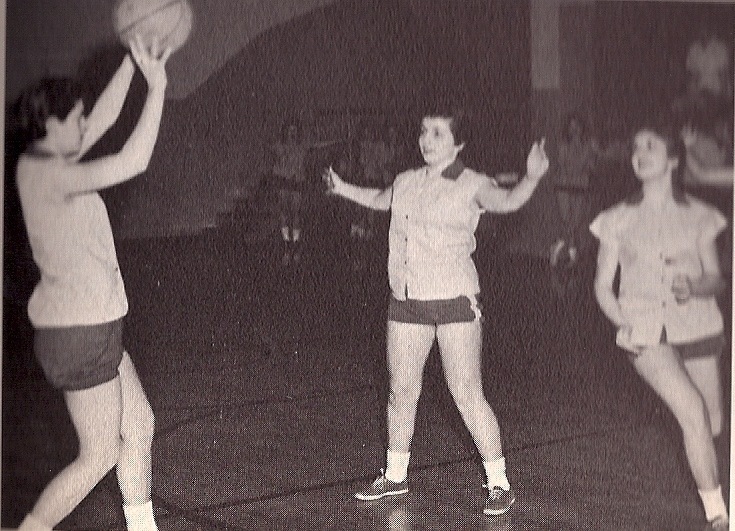 Coach Brunton ran a three guard offense with Lucy, Elaine and Roberta outside and Janet, Janice and Carol or Marianne underneath. They were undersized but could jump and had good timing and good hands. They had another advantage. 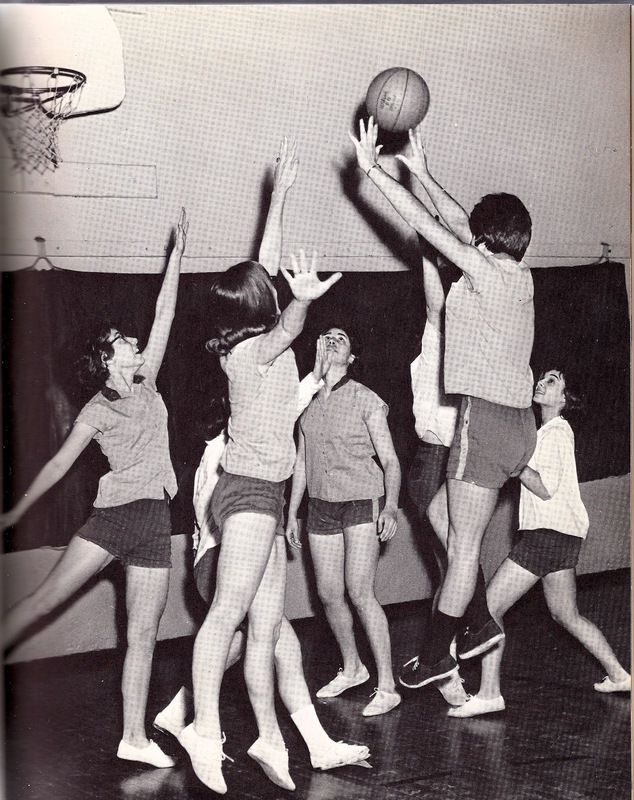 Notice except for Judy playing volleyball and Carol playing basketball, 10 senior girls played both sports plus three were cheerleaders. This gave them a conditioning edge which often showed up in fourth quarters of close games. With more than two full platoons, they simply ran most teams to death. Tumbling was the girls' third major sport. It was in sort of a gray area between sport and theatre. The girls learned various stunts and routines and would have been competitive in a gymnastics tournament, but most of their events were actually audience performances, like Council Capers. 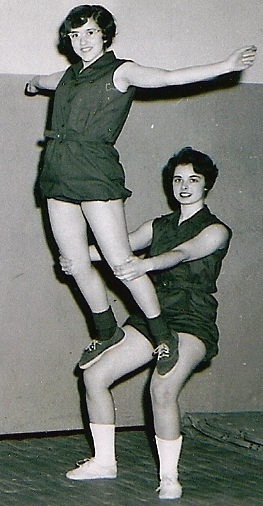 Here, Carol provides the base for a flying stance by Judy. 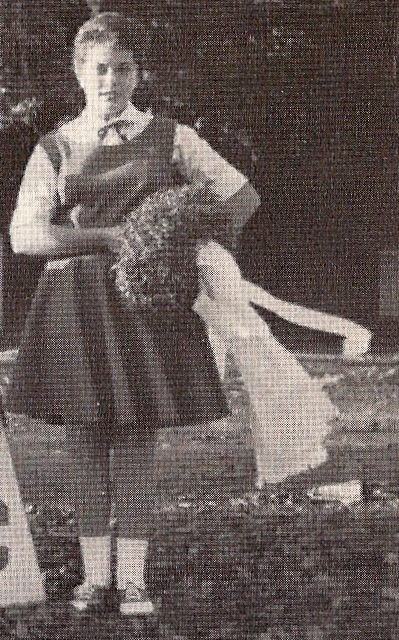 Notice the bloomer type pants and collared, button front tops. One of the little known stories of our time in high school was that Stanley's first love was really basketball. By the end of ninth grade, he had decided to give up football and focus on basketball in the hopes of winning a Division I scholarship. When August 1 arrived and he did not show up for the Summer conditioning drills which preceded the opening of formal football practice, Coach Milanovich, Coach Letteri, and several players realized this meant their already short roster would be missing another talented player. Coraopolis was too small a school to have any success in Class A competition unless they got every talented player on the field. So several visits to the Truskowski home ensued. Reluctantly, Stan agreed to play high school football. Of course, our undefeated senior season would never have happened without him. He earned that Division I scholarship in football, choosing Arizona State from a dozen offers. That proved to be a mistake. Before the days of cable tv, we could not watch West Coast teams play. Only after arriving at Arizona State did Stan realize Coach Frank Kush ran a conservative ground game and threw very few passes. Kush was also famous for brutal practices in the hot desert sun. And Stan did not find Tacos, Burritos and Cactus Flower Wine his idea of good food. So after one year, he looked to transfer back East. Pitt had pursued him before, and offered him again. Stan was really torn. He wanted to major in Engineering, and Pitt had a great engineering school. But he would have to sit out a year. So he chose Slippery Rock, where he could play immediately, even though it meant he had to give up Engineering. He was really over qualified to play at the small college level, and led Slippery Rock to a spectacular three years. In his senior year, he led them to the national championship game. 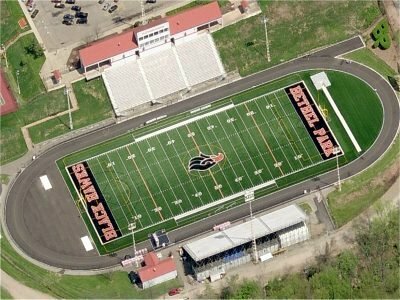 The Pittsburgh Steelers had launched a minor league training team, the Pittsburgh Mustangs, which played their home games in Charleroi Stadium. They signed Stan and he enjoyed a fine rookie year. 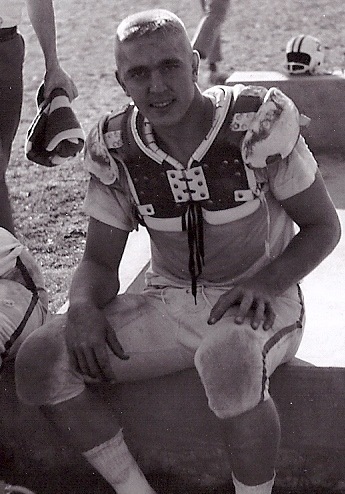 But the Steelers were overstocked at Stan's positions, and rather than chase his dreams around the country, he decided to end his football career and go back to graduate school. Armed with a doctorate, he devoted one career to college education, then retired and has spent the last decade running his own consulting firm. Fred Milanovich had produced over achieving teams at Coraopolis for 15 years before we came along. He had been an All American basketball player himself in three years at Aliquippa, one year at Purdue, three at Geneva College, and five years in the NBA with the Rochester Royals. At Coraopolis he had produced one unbeaten championship football team and two championship basketball teams. But he had problems. Coraopolis was the smallest school in the WPIAL playing Class A sports. We were a Class B school. Had we been willing to play in Class B where we belonged, we would have enjoyed great success. But we were not willing. It was a proud town which considered itself Major League. The WPIAL had a provision which allowed a school to play above its class by request. Since World War II, Coraopolis had insisted on "playing up" under this rule. They used their steel money to hire the best coaches they could find and were content to hover around .500 during rebuilding years and win championships every third or fourth year. Milanovich agreed with this philosophy. He liked matching wits with the top coaches and top teams and did not want to coach in Class B. But this era was ending. The WPIAL voted to end the "playing up" loophole. Cory would be forced to play within its own enrollment class. The Fall of our senior year, which was 1959, was supposed to be our last season in Class A (pending an appeal, which would delay the move for another year). It would be our final games against century old rivals like Moon, West Allegheny, Montour, McKees Rocks, Stowe, Carnegie and Crafton. And it looked like a sad farewell. We had a core of 16 good players, but there was little talent on the bench. Of the 16, 12 would have to play both offense and defense, against teams with separate offensive and defensive platoons. No poll, no rational observor, saw any way to salvage a .500 season out of this. If Milanovich could pull a rabbit out of this hat, he would be voted football Coach Of The Year for the third time. As we began practicing in August of 1959, it was obvious our strength was in the backfield. We had talented runners, receivers and a great passing quarterback. Bill and Leo were talented wide receivers. Nick was another receiver plus the best broken field runner Cory ever had. Jimmy had speed. Jerry was a bull, able to pick up short yardage right up the middle. Stan could either run or pass. So we had an offense which could move the ball. But could our line protect them on offense and keep anyone from scoring on defense? Ross Hamer was the smallest lineman in the WPIAL. Would opponents simply isolate him and run over his position? The entire season would depend on the line. Which meant it depended on one coach : Frank Letteri. Letteri had played for Cory and Geneva College, then for the Steelers, until an injury ended his career. He had been an assistant under Milanovich for several seasons and knew how to prepare for each team on our schedule. But every team on our schedule had bigger linemen and more of them. The biggest danger was our opening opponent, Bethel. They were the largest school we would play, they were expecting one of their best ever teams, and the game was at their stadium. We could not afford to get several players injured in our first game, and getting run over by a lopsided score could be demoralizing and make winning at least half our games impossible. As the Labor Day weekend approached, Coraopolis football fans were apprehensive. As usual, buses and carloads of fans made the trip out Route 51, but they were not optimistic. What they saw sent storm flags up across the WPIAL. Bethel could not score. Nor could they get a first down. Letteri's defensive line stopped the much bigger opponents cold. On offense, Bethel could not break into our backfield. Our line held on both sides of the ball. Ross Hamer, thought to be our weak link, instead became the hero of the game, repeatedly stopping runners like a brick wall as they tried various off tackle, slant and trap plays over his position. The feeling on the bus ride home from Bethel was more than relief. It was celebration. We knew. We knew. This was the biggest and one of the toughest teams we would play. This was not going to be a struggle to finish at .500. We were going to make a serious run. Letteri's line was ready for war. Bethel was also the coming out party for Nick Spinelli. He was a talented all round athlete who lettered in three sports. Nick was a high energy, aggressive character who loved to joke and tease, had little tolerance for sitting still, was always pushing the envelope, and was rarely quiet. He was an outstanding basketball and baseball player. But on a football field he was a rare and special talent. He had speed, quickness, great hands and feet, strength, and seemingly inexhaustible stamina. He had an inner gyroscope, a sense of body balance, that made him extremely difficult to bring down; halfway to the ground he would somehow regain his balance, struggle loose and keep running. If he could get just a few fingers on a pass he could bring it in; opposing coaches marvelled constsntly at how he seemed to have glue on his hands. 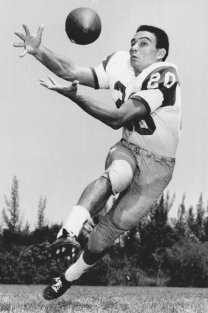 Rip Engle of Penn State considered him "the finest broken field runner I've ever seen in high school." As the season progressed, the area around our press box filled with college scouts. Many of them were here to see Jimmy, Stan, Jerry, Dom, or Ange, but at least half of them were here to see Nick. Coach Milanovich's log book at the end of the year showed visits by Ohio State, Syracuse, West Virginia, Pitt, Maryland, Michigan, Notre Dame, Kentucky, Alabama and two dozen others, but in the end Nick signed with Miami. 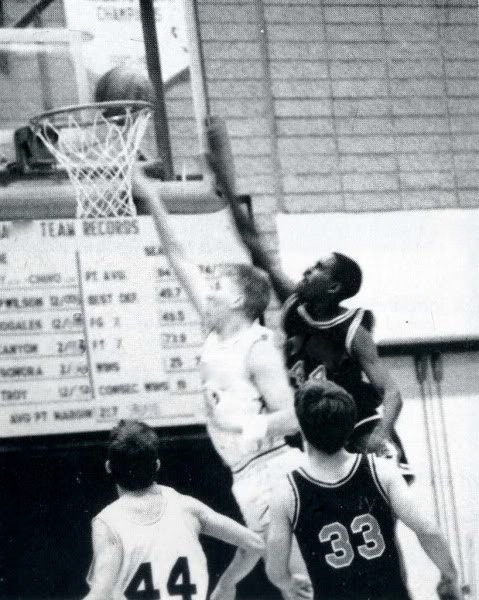 In addition to his physical skills, he had a certain intensity about him; he hated losing and was determined that in this, his senior year, he would not allow it. Nick not only had quicker physical reactions. He had quicker instincts; he just saw and thought quicker. Several times a game he would be completely surrounded by opposing tacklers, two or three of which already had hands on him, only to spin, dart and twist loose and escape for long runs. He became All American at Miami and spent an NFL career with the Patriots before an injury sidelined him. As we were running over West Allegheny 33-0 and left tackle Angelo Nolfi was scoring the only TD of his career, two very interested parties were on the roof of the press box. One was using an 8 mm movie camera to record the game. The other was taking prolific notes. When they reported back to their boss, Chuck Klausing, the next morning, they did not bring good news. They watched the game film together after it had been left overnight with an East Pittsburgh film developer. The verdict : Coraopolis was for real. Klausing was the coach at Braddock. 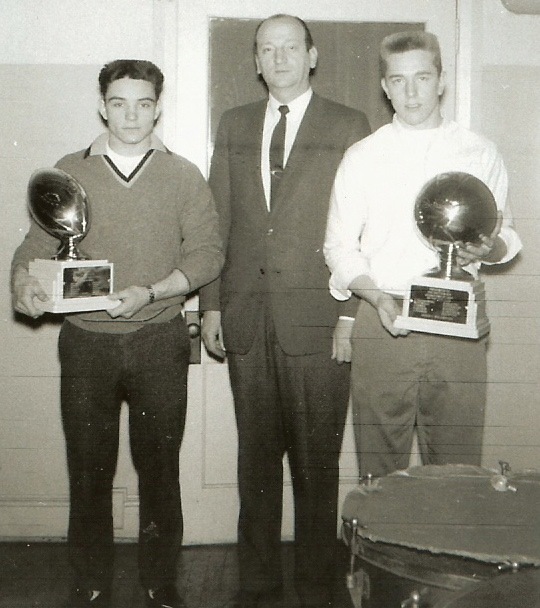 In September of 1959, there were two reigning kings of Pennsylvania football. One was Montour, which had not lost in three years and won three straight Class B championships. Montour was playing in Class A for the first time this season and were on our schedule. The other dynasty was Braddock, which was on a 55 game winning streak and had won four straight Class A championships. Klausing had his best ever team in 1959, with quarterback John Jacobs, halfbacks John Gay and Ben Powell, and wide receiver Ray Henderson. He believed winning resulted from attention to detail. He scouted all of Class A. He did not like surprises. And this Coraopolis team was a surprise. Klausing told the Tribune , the daily newspaper covering Braddock, "There are two teams this year that can end our streak: North Braddock Scott and Coraopolis. Scott has such great size, but we've never had size. We've always won on speed and quickness. We just outquick and outrun people. That's the secret to our streak. But this Coraopolis team is faster and quicker than we are. They have speed at three spots in their backfield and in all their receivers. Even more worrisome, their linemen are quick and have quick feet. Most high school linemen are really slow on their feet. You isolate the positions with the slow feet and run through them. But this team has no slow footed kids anywhere on the offensive or defensive line. Their defensive backs are both quick and fast. Mark my words : If this team stays healthy and its players stay eligible and out of trouble, they're going to be waiting for us in the WPIAL title game. And I seriously don't know if we can match up with them or not. You can bet we'll have scouts at all their games. We've got to find some weakness. But watching the film we have on them so far, I sure don't know what it is." Braddock would continue winning. In the regular season finale, Henderson would catch a 60 yard pass with 37 seconds left to salvage the win over North Braddock Scott. The win gave Braddock the all time national record for consecutive wins, breaking the record set by Paul Brown's Massillon (O.) team 20 years earlier. As predicted, Klausing and his Tigers were waiting for Coraopolis in the WPIAL title game. Sports Illustrated had scheduled a team of reporters and photographers to cover the game. It was to be the showdown of the decade in Pennsylvania. As Coraopolis and Montour prepared for their midseason battle of unbeatens --- Montour had won three straight Class B titles before moving up to Class A and had won its first five games this year --- we felt we were playing ourselves. Montour's two best players, Dale and Wayne, had both grown up in Coraopolis, been Boy Scouts in Troop 133, and gone to school here. At the end of sixth grade, they had moved to Robinson Township. In fact, Dale moved right across the street from Gladys Donaldson, our English teacher. And Dale and Wayne weren't the only ones we'd lost. Vite grew up on Montour Street and went to Lincoln, but was now an All State lineman at Moon. Kenny grew up on Cliff Street, went to Lincoln, and was now in Port Arthur, Texas. Donny grew up on Devonshire, went to Lincoln and moved to Charlton Heights. Basketball was a similar case. Harold and Richie, who were first team All State, played against us in the playoffs, and went on to the NBA and National League, went to grade school here. Joe moved to Moon. Bo and Tom for whatever reason did not play our senior year. So we won championships despite major losses. How good might we have been ? After Coraopolis had rolled over Montour 19-6, Coach Bob Phillips, who would come back to win another championship the following year before moving on to college coaching, predicted that Cory would win the Class A title. "No team can stop them," he explained, "including Braddock. The only way they lose is if one of their 16 Iron Men is injured, gets sick, becomes academically ineligible, or gets in some sort of disciplinary trouble. On offense they present you with too many problems and no matter what you cover, they go to one of their other options. They have the best ground game in the WPIAL. Spinelli, Swartz and Orsini are all Division I running backs. They're fast, quick, clever and hard to bring down. But you can't focus on them. That quarterback can pick you apart. He's also a Division I prospect, and he's got Curry and Beaucant on the ends and Spinelli and Swartz flooding down at you. So he's got four options to pass to, they've all got good hands, and the final threat is he can run the ball straight at you. There hasn't been a Class A offense in 10 years with this much speed, this many options and this much experience. These guys have been playing together for so long they know each other's moves. I think they could run these plays blindfolded. Look at your stat sheet. We came in here with a three year winning streak, this was a huge game, and these guys did not commit a single error. No fumbles, no interceptions, no missed assignments, no slipped tackles. They do not beat themselves. We're famous for forcing errors, and they gave us nothing. If they don't get anyone hurt, I'm laying money on the table right now that says they go all the way." Phillips left Montour to become a 24 year assistant to Penn State's Joe Paterno. During his last five years at Montour, the Spartans would win four WPIAL championships and suffer only one loss and one tie. This was that loss. The tie was to McKees Rocks. At left, Ross receives his letter sweater. 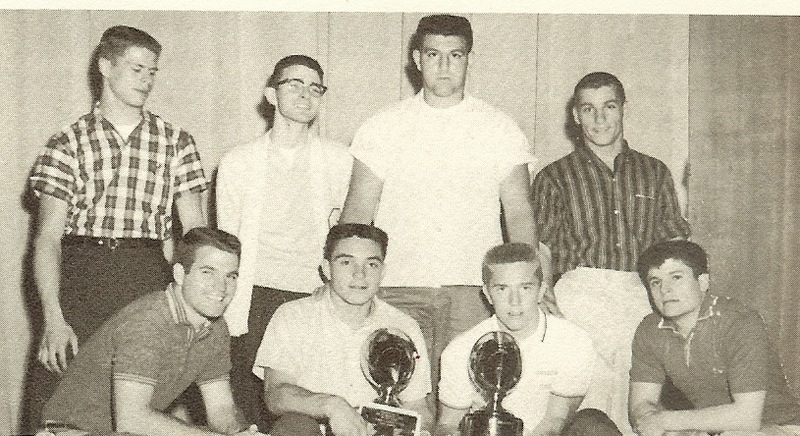 In the 60 seasons since 1950, he remains the smallest lineman to ever be named All WPIAL and All State. Playing football can be the greatest experience in the world on a crisp, cool Fall evening. When it becomes miserable is when the weather turns hostile. Cold is bad but wet is worse. The third Monday of October it started to rain. It never stopped. It rained all day and all night all week. From the high school library, we could hear McCabe's Creek foaming and rushing in the hollow below Sweterlich's. By Wednesday the river was rising. 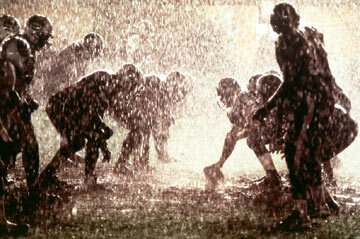 Each day's football practice was worse than the day before as the field became wetter and muddier. Carnegie could not practice on its own field Thursday because of flooding. They staged a late evening workout at Montour's high and dry Burkett Field. By Friday afternoon it was obvious we could not play the game. There were two inches of water on our own hilltop field. We postponed until Saturday night hoping the rain would stop. It did not. Saturday afternoon we postponed until Sunday afternoon. The rain continued. We agreed to a final postponement until Monday, knowing that under WPIAL rules we had to play the game, and we had to play Monday, because regulations required four days between games. The rain continued. There were six inches on some parts of the field, at least three everywhere. We could not get our footing and we could not see. The ball was slippery. Tackling was difficult. Blocking was difficult. Passing, our great strength, would be extremely limited. We were soaking wet and freezing cold. Most of us had been playing football since fourth grade and this was the worst experience of our lives. Carnegie kicked off. We were on our own 38. On the first play from scrimmage Jerry ran the ball into the line for two yards. On the second play Nick splashed around right end and headed 60 yards for a touchdown. Bill kicked the point. The rain somehow intensified. We kept punting back and forth. Between quarters the rain let up briefly. "We've got to go for it," Leo said, "while we can see." We brought a dry ball in and lofted it 20 yards to Leo. He took it in just as rain picked up again. 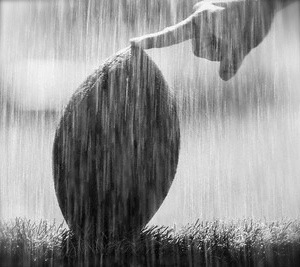 The wet ball slipped on the extra point try. We led 13-0. No one got even a first down the rest of the evening. Afterward, the Carnegie Coach was angry. "The WPIAL should have let us postpone this until after the regular season. Our kids work all year to play nine games. They should not have to throw away one of those nine on a night like this. I love football. What you saw tonight is not football." When it was all over, not only did we finish undefeated and win the championship, college scholarships for several players, and coach of the year honors for Coach Milanovich, but we would be remembered as the greatest football team in school history. 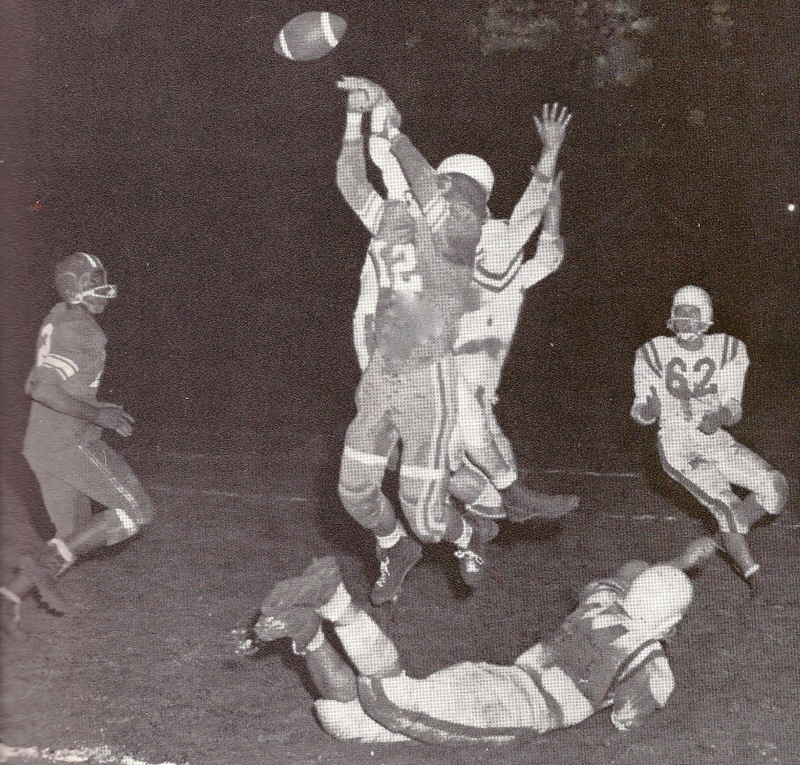 In the 50 years since that 1959 season, no Coraopolis or Cornell team has finished undefeated or won its championship. Of the eight guys in this photo, five would graduate from college, three would play four years of college football, two would start on top 10 college teams and play in postseason games, one would play for the national championship, and two would enjoy professional careers. 20 years later, after his own career as head coach and athletic director, Frank Letteri would remember 1959 as his finest job of coaching. We were the last generation to enjoy outstanding athletes leading cheers for the guys. Thanks to Title IX, our daughters could play half a dozen sports rather than remain on the sidelines in support roles. Had all this been true in our day, there was almost no chance our three seniors would have been leading cheers. Marianne, Janet and Grace were talented athletes. The week before she implored the crowd to cheer us on to that 72-69 come from behind upset of Upper St. Clair, Janet (right) had poured in 31 points in a basketball game against Bellevue. Had we had a gymnastics team, Marianne (left) would have been its star. Had we had a soccer team, Grace would have been captain. Anyone who ever played knows the adrenalin rush the crowd noise can impart. We were an under dog all year in both sports. These girls created that crowd noise. They were as responsible for those wins as anyone, and had they had other opportunities, we would not have had their services. By the time our own kids were in school, cheerleading had become a sport in its own right. Girls spent their weekends competing in huge tournaments. They worked on skills more aligned with Olympic gymnastics and modern dance than with motivating the crowd and supporting teams. In modern megaschools, often the cheerleaders are not even on the sidelines during big games, because they're off to Texas or Florida for tournaments where college scholarships are awarded. We were fortunate to have these girls still revolving their schedules around our football and basketball teams. And their efforts were not limited to Tuesday and Friday nights. All week long they were busy generating enthusiasm, making sure no one forgot that there was another Big Game coming up. A decade later, when coaching at Beaver South Side, Fred Milanovich, visible behind Marianne in the photo below, gave the girls their credit. "They were worth 10 points a game in basketball," he said in a Beaver Times interview about his Coraopolis championships. "We had a small team with no depth. We had to play on adrenalin. They kept that adrenalin flowing. They helped some in football, but they were critical in basketball." We were the last of an era in other ways, too. Today, high schools field cheerleading teams of 16-20 girls. We had six. But they generated more crowd noise than the modern 20, because they were performing for the crowd and to generate that noise, not for the benefit of judges keeping scoresheets on the sidelines. 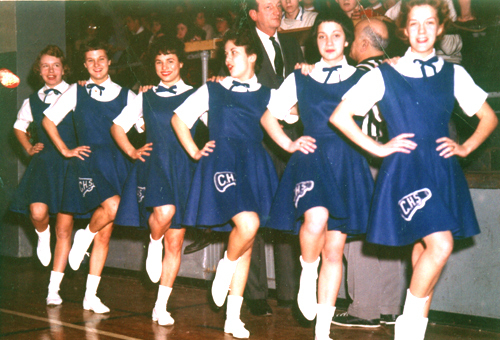 Today, cheerleaders rarely support the team at away games, and when they do, such as postseason tournaments, they go in cars or a separate van or short bus. Ours rode the team bus to all games all year. There was never a problem. Today, schools have as much trouble keeping cheerleaders eligible and out of disciplinary trouble as they do players. The lineup of six girls we had our senior year were all honor students. We had good basketball teams in junior high and expected to continue that success. 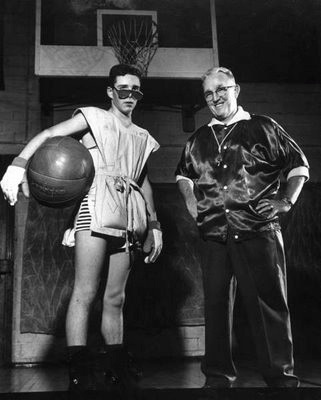 But our ninth grade year, the varsity led by Norm Maxwell and Bob Croasman were spectacular. In the last game Cory and North Allegheny played for the section title and we were all there. Cory won with a last second shot. We followed them to Pitt Field House where they lost a heartbreaker to North Braddock Scott by one point as a last second shot by Maxwell circled the rim three times before dropping off. It was a standing room only crowd and we came home determined to bring Cory another championship. Driveway courts continued to get heavy use. We talked Coach Milanovich into summer workouts. The varsity fell short our sophomore and junior years but down on the JV under Coach Frank Letteri we were polishing fundamentals and getting ever better at playing together. Our junior year, things began coming together. Stan was up on the varsity, but we had Al, Pete, Dave, Tony, Danny, Frank, Nick, Ange and George from our class and Jay and Jim from 10 grade on the Junior Varsity. Coach Letteri ran Summer practices and those of us not playing football worked out on our own in the gym after school and at home on our driveways, with frequent trips to Aliquippa and other places for pickup games on the playgrounds.. By November we were ready to roll. We won 21 games in a row. George developed great timing under the boards and Nick kept defenses off guard alternating between perimeter shooting and slashing drives to the basket. Pete became the valley's best sixth man, totalling as many minutes off the bench as any of the starters. 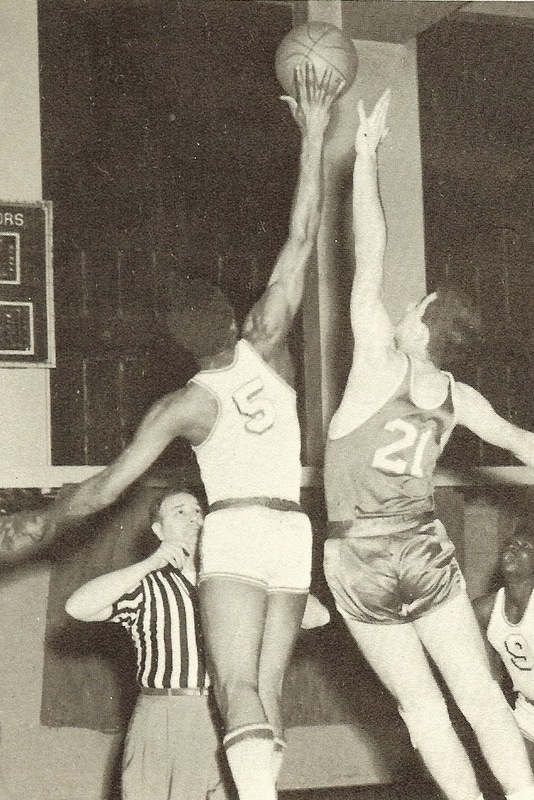 He was only 5-10 in 11th grade and was not a great scorer, but had two huge advantages : his unusually long arms, and quick hands and feet, which allowed him to dribble, pass or shoot over or around opposing defenders; and made him the team's best defender. It was Pete who shut down Rox's Willie Dean and Stowe's Skip Tatala in close games we HAD to win for the section title. Then it was on to the JV Playoffs at Dormont. We immediately began practicing for next year. Confident and wanting to sharpen our game against the best, we challenged Wampum, Aliquippa and Midland to off season scrimmages. Into the hot and humid Summer, we kept practicing until football workouts began in August. From fourth grade we had dreamed of sweeping both major sport titles our senior year and now it was time. 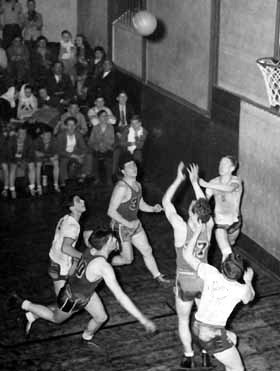 Pete is seen here at left anticipating the rebound in a game at West Allegheny. Notice the player to Pete's right staggering off balance, having just been "nudged" by a well placed elbow from Pete. Also notice these are not our standard JV wool jerseys. Van Balens Laundry cleaned our uniforms, but they could not run the wool uniforms through the standard process or they'd shrink. They had to launder them special. Two or three times a year they would be late getting the jerseys back to us, so we had to wear the backup jerseys. We always liked that, because the wool itched and the backups were made of cotton and did not. Varsity jerseys were made of rayon so Van Balens could run them through the regular process and get them back on time every week. The WPIAL did us no favors. On November 1 they announced they were realigning the sections and moving us into section 14 with state powers Avonworth and Upper St. Clair and perennial contenders Avalon and Bellevue. It was one of the toughest sections in the state, with two All-Americans back for their senior seasons : David Sauer of Avonworth and David Montgomery of Upper St. Clair, both big centers, taking advantage of our size weakness. Cynics accused David Pharoah and the commissioners of intentionally trying to keep Cory out of the playoffs. We faced the further handicap of working late finishing football players into the lineup, making December a tough transition. We lost three games as football reflexes shifted over to basketball reflexes. But we had ten seniors who had been playing since grade school, we were all fundamentally sound after years on driveways and playgrounds, and we had won at every level on the way up. 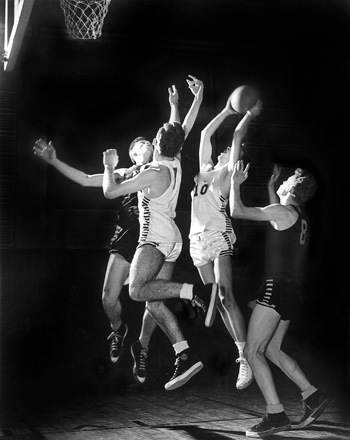 We had depth, speed, shooting and quick hands, and in George (below right # 5) and Stan (photo on home page top right) we had two rugged leapers with great timing who could hold their position underneath. We had a huge home gym advantage, a strong fanbase which would follow us to every road game, and a special feeling of urgency. As seniors, for us there would be no tomorrow. 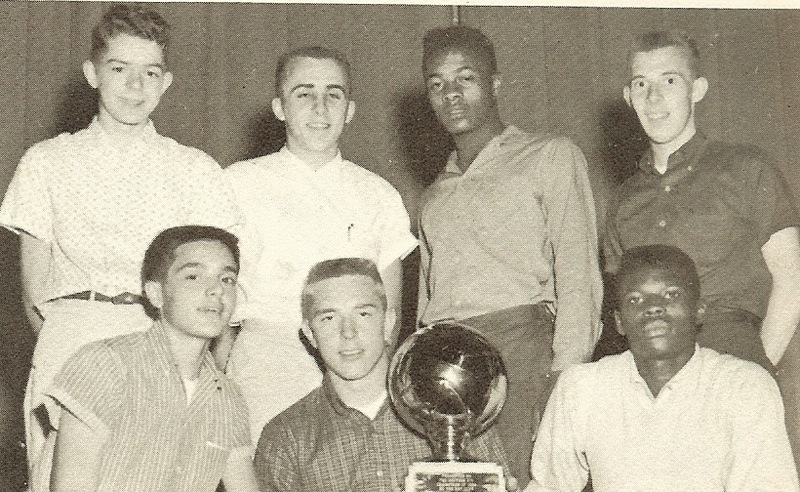 Even though almost all us would go on to colege, some would play football, some would drop sports altogether, and only three would ever again play basketball on an official team. The adults also had a nagging worry that with the mills closing, population declining, resources shrinking and the state talking about forced consolidation, this could be Cory's last chance at sports glory. There was a certain grimness every time we took the floor. We HAD to win. We had spent 10 years on playgrounds, driveways, the Y and gym classes playing basketball as a Game, but for six months of our senior year it was a War. Just as the football team had opened with a powerful opponent, so did we in basketball. Swissvale had long been our traditional first game, we had never beaten them, and this year they were loaded. They returned five seniors and featured All Stater Tom Fullen, who as a junior had led their varsity with 20 ppg. We alternated our 1-3-1 to clog the wings with a man to man rotating Nick and Pete on Fullen. We still trailed 32-28 entering the fourth quarter, but Nick and Pete would shut down Fullen the rest of the way, Jay Banks would score five baskets from the corners, and we upset the Golden Tornadoes 42-36. Like the football shock at Bethel, our opening win sent storm flags up across the WPIAL. Shown at right is a Chuck Connor Converse All Star Basketball Shoe. We were issued these by the school every year from 7th through 12th grades. They were the best basketball shoe made at the time. Some years we voted to get whites, some years blacks. There was a low cut model, but coaches always insisted we get high tops for the ankle support. They still make this shoe. 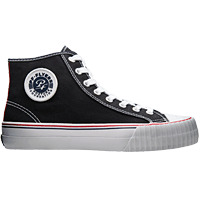 Kids today call them "Chuckies" and wear them for "hanging out." Looking back, it's a wonder we did not all suffer from fallen arches and various foot ailments from the lack of arch support the Converse provided. We would wear these shoes during the regular season, then wear them during the off season for pickup games until they fell apart. Those of us who went to summer basketball camps would get another pair there. Even colleges and NBA teams used this shoe. It seemed like Butler Hennon and Wampum had been hanging over us our entire careers. The Allen brothers had gone to Lincoln School and been teammates on our AAU team. Then, mysteriously, their mother decided to move to Wampum and they ended up playing there. Hennon was born and raised in Beaver County, but early on realized that the best high school basketball in the world was played in Kentucky and Indiana. So he went out there for coaching clinics and summer camps and even took his wife on their honeymoon to Lexington, Ky. and Bloomington, Ind. for coaching workshops. Out there, he picked up the idea of starting kids very young and using all sorts of wierd practice devices to create what he called an Overload. 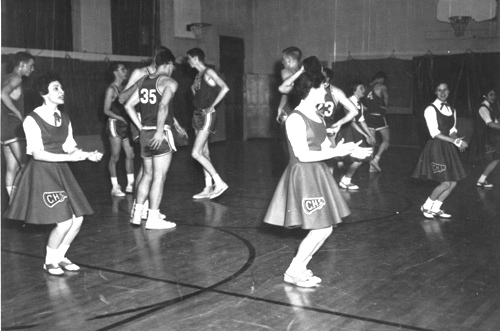 Wampum teams practiced in boots, wore gloves, used a medicine ball, weight belts and special goggles with the bottoms blacked out so players couldn't see the ball while they dribbled. He also used smaller rims, changing them out for regulation rims on game nights. Hennon taught a fast breaking, full court pressing style that resulted in his teams averaging 90+ points per game over the six years we were in seventh through 12th grades. There were other Coraopolis connections. Danny's cousin Ron Galbreath played for Wampum. Carol's mother was from Wampum. Our AAU team had continually run into Wampum in tournament semis and finals, winning about half the time over the six years. Coach Milanovich was from Beaver County and knew Hennon. We kept urging Coach to schedule them. If they were the best, we wanted to play them, to test ourselves against them. After our championship JV season we wanted to set up a Spring or Summer unofficial exhibition. If our AAU team was beating them, we figured we could do the same with our school team. Throughout our senior season, Avonworth, Upper St. Clair and Coraopolis kept moving up and down in the rankings as we took turns beating each other at home, but Wampum was always ranked number one in the state. When we upset Avonworth 69-63 at Mt. Lebanon Fiueld House, it was official. We would play Wampum. . When it was all over we had added the basketball championship to our football trophy, which completed the sweep many of us had dreamed of since grade school. From the photo at left, four of us would graduate from college, three would play at the college level, one would play in Europe, and one would become a career high school and college coach with six state and two national championships and two teams a point shy of the Final Four. Ironically, on a team lacking size, in the 18 months after this photo was taken, Pete and Danny both gained significant size and weight and enjoyed successful playing careers at their respective colleges. We also played this season without Bo and Tom, who since grade school had been two of the best players in town, and without the Allen Brothers, who ended up playing against us when their mother was hired by the Cement Plant at Wampum. 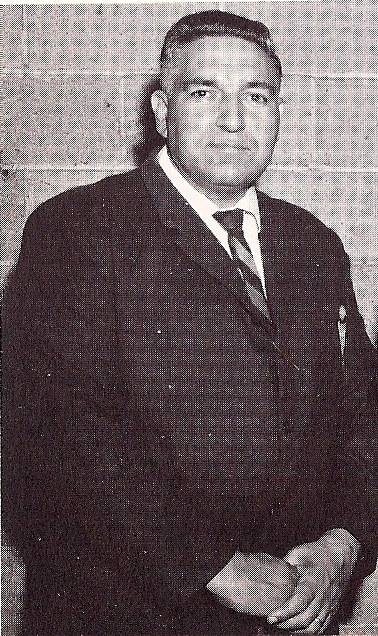 Our longtime coach, Fred Milanovich, would win coach of the year honors. He left Cory after this season and, although he coached 12 more seasons at two other high schools, he would never again win a title in either football or basketball. Like all championship teams, ours were a collection of stars, each of whom contributed in his own way. Singling out individuals is always difficult. But if two guys had to be named Most Valuable Players, it would probably have been Nick in football and Stan in basketball. Both would go on to play at Division I colleges and for pay after that. Both were multisport athletes who excelled in other sports, Nick in basketball and baseball, Stan in football and track. Ironically, Nick made his name as a practically unstoppable runner but in college would be converted to a defensive back. 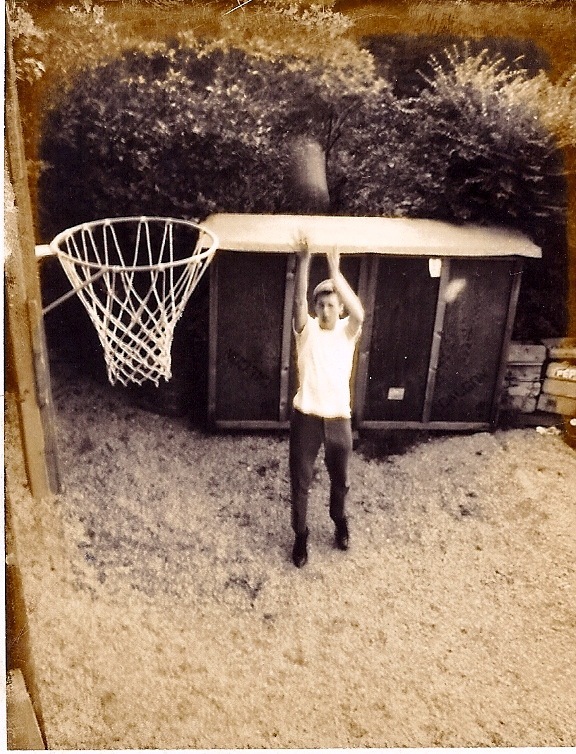 Stan con- sidered basketball his favorite sport and always thought he was better at it, but it was in football he would lead his college team to the national championship game. Coach Milanovich had been an All American basketball player at LaSalle and Geneva and had played in the NBA with the Steubenville Barons and Rochester Royals. But he is remembered today as the coach who led Coraopolis to its greatest era: three unbeaten teams in 15 years and a 70 percent overall record in one of the nation's toughest high school conferences. 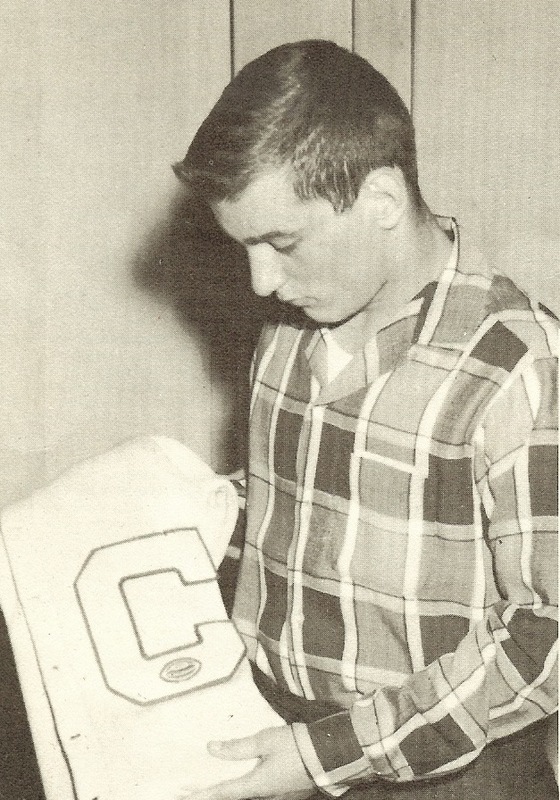 In the 50 years since we graduated and Coach Milanovich left, no Coraopolis or Cornell team has gone undefeated or won a conference championship. Track was a tedious sport. We started the day after basketball ended. For the first month we worked out in snow, sleet, hail, cold and wind. Then the rains came. There were no crowds and no media coverage to make it worth while. A meet would last three hours and each one of us would only compete for a few minutes but we had to sit around the rest of the time waiting for everyone else. There were a few dual meets, but most involved from three to 10 schools so winning a given event was very,very difficult. Mr. Brown was a good coach but track involves so many different events that no one coach can spend more than a few minutes a day with each athlete. We were pretty much on our own. There was no scoreboard so during a meet we had no way of knowing who was winning or what the score was. Several of our meets were at AA schools like Ambridge, which meant we were also facing opponents from Aliquippa, Beaver Falls and Butler. Despite all these discouraging factors, many of our classmates participated on the track and field team and did quite well. Coraopolis had a statewide reputation of producing strong contenders in the pole vault and distance events. 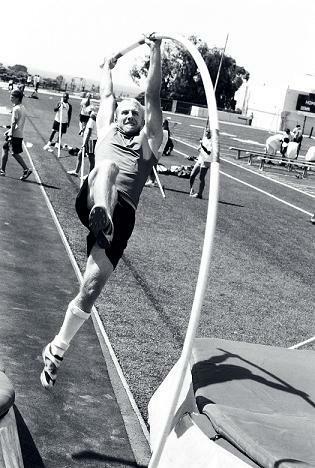 As we arrived in high school, Lionel Bassett was winning his third state championship in the mile run, Norman Maxwell was finishing third in the state in the 440 and anchoring the mile relay team, and George Pessy was ranked number one in the pole vault although a muscle pull kept him from a state title. After they graduated, Stan continued the pole vault tradition and Ed Smith picked up our mile running duties. Coraopolis did not have a good high school baseball tradition. We should have. We had one of the best little leagues around and good athletes playing on the high school team. But several issues prevented us from developing a strong program. First, the baseball coach was always a football or basketball coach filling in during the Spring. We never had Fall or Winter practices because he was busy with the other teams. We did not have a good facility. There was no money invested in the program. Weather was a constant problem and with no indoor practice facility, it was hard to build any kind of consistency. We did not play as a team during the Summer. Once the boys became too old for Little League, there was no feeder system set up in the junior or senior high to bring them along as a unit. For example, we had no freshman or JV baseball teams. So, for us, baseball was an afterthought. We finished basketball season, then invited anyone interested to come out for practice. Meanwhile, we were playing in one of the best sections in the WPIAL. McKees Rocks, Montour, Moon, Carnegie, Crafton, and Quaker Valley all had strong year round programs run by coaches who coached only baseball and had played and been good at it themselves. Only Stowe, with Milan Tatala coaching basketball, and West Allegheny, with very poor facilities, had the same kind of program issues we did. We beat those teams consistently. Otherwise, each year, it depended on who showed up that first day of practice and who we kept healthy, since there was never any depth. The fact that we spread our good athletes around track and field and golf did not help. Our senior year, we had four strong baseball players on the roster. Ronnie (above, safe on base as the defender is too late with the tag), Nick, Don and DaveD had come up through Little League and played on their own in mid teen leagues up and down the valley during the Summer months since leaving Ewing Field. They were the leading hitters and fielders. Dave (right) was our lead pitcher. He was the only true pitcher on the team, but baseball doesn't work that way. WPIAL rules limit the number of innings a player can pitch per week so as not to injure the rotator cuffs on young arms. So we used Dave against our strongest hitting opponents, then filled in as best we could for several games while he rested and waited until he was legal to pitch again. Coach Frank Letteri tried everybody on the roster on the mound trying to find other good pitchers, but pitching remained our main weakness. The thin roster impacted pitching in another way. Even Dave, when he was not pitching, had to play another position. So instead of resting completely for several days, our pitchers were still out in the field, using their arms to throw and their legs to get into position. 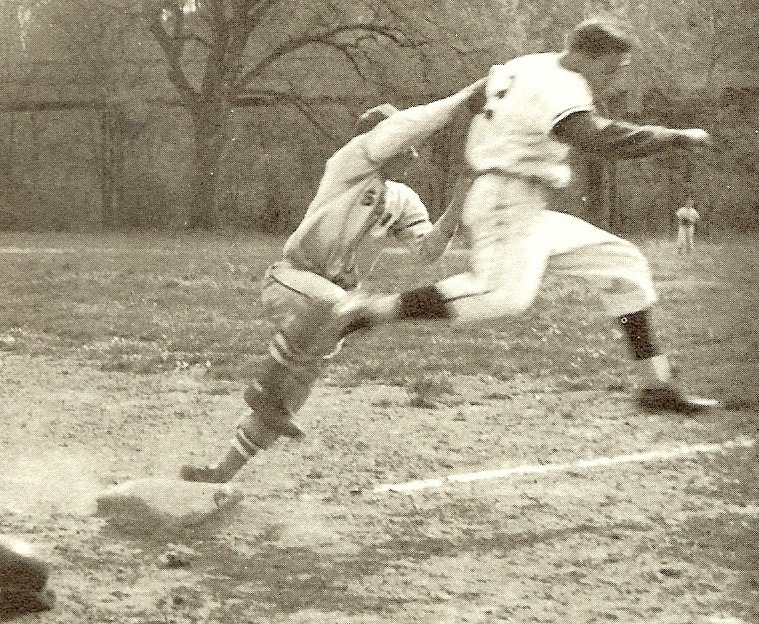 Of all sports, baseball places the most emphasis on split second timing. Hitting requires a lot of coaching and practice in batting cages. Today, Coraopolis has two major public batting practice facilities, one on Neville Island and the other in Moon Township. But when we were in high school, we had none. For a team to pull off double plays or other defensive maneuvers requires lots of drilling and coaching. That kind of time was simply not available. So we had a good time, played against top competition, won half our games and lost the rest by close scores. We won no championships, but we did better than Coraopolis had done for a decade. Please email your photographs to Cory@aol.com. We especially need photos of the Friday Night Club, various scenes at the YMCA such as pool, pingpong, swimming, weight lifting and the gym; junior high football or basketball; classroom scenes in elementary or junior high; various students' cars, school holiday decorations such as Christmas trees; students in their homes with their Christmas trees, and field trips. We need photos with recognizable faces. Do not send original photos by mail; they are too valuable and it is too risky.